A really multidimensional perennial for part shade, rich soil and light summer water. The sage green, almost rubbery textured leaves are emargined in creamy white. 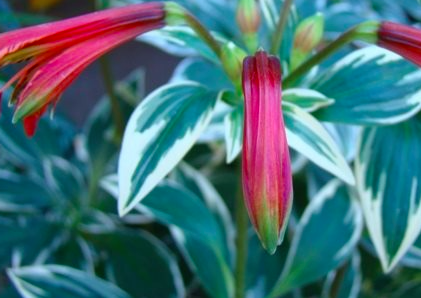 In summer, 2′ spikes support groups of tubular red and green flowers. The interior of the flower is decorated with black hatch marks on a white backdrop. Fantastic long lasting cut flower that should be pulled gently from the base to detach and never cut with a pruner. Spreads somewhat thinly to cover some ground. Posses the ability to compete with other plants and can happily coexist with shorter ground cover- flower spikes coming up right through. Completely winter deciduous. Bait for slugs when it first re-emerges in spring. Once its up a bit you are safe. Long lived cold hardy perennial that is pretty permanent. Hummingbirds love the flowers as much as stylish gardeners.